I felt I have heard God a couple of times in my life so far. Once when I was having trouble falling pregnant, I took a pregnancy test and it came up negative...yet again. I was so disappointed and was praying about it when I 'felt' I should do the test again. I argued with what I thought was myself - pregnancy tests aren't cheap, that would be silly, I only took it a few minutes ago, etc, etc. But I finally did as I felt led to do and lo and behold it showed a positive! I will never forget that. Another time I was starting a new job and I was going to work with a person I had worked with some years back. I have a terrible memory and could not for the life of me remember her name and I had to start the next day! I knew her name ended in the 'yah' sound (like Tania) but none of the names I could come up with sounded right. I was at the end of my tether and decided to pray about it and see if God could tell me as it was going to be extremely embarrassing for me! The 'thought' came to me that if I want to hear from God I should read my bible first. But of course I argued to myself (as I do!) and thought I'm not going to get a modern day name from the bible! So I think God gave up on me and just told me! Gloria. (I really do believe this was from God because I could not remember her name and it just popped in my head as soon as I asked!) Then I had to laugh because I thought if I had opened the bible and read "Glory" I think it would have prompted my memory straight away. I think God has a wonderful sense of humour! I know these aren't 'big' things but the point was I stepped out in faith by asking God for His help and He came through for me and that was BIG to me! I know God doesn't always work this way but I sure do appreciate it when He does. Want to learn how you can truly hear from God in your daily life? 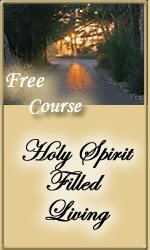 Read The Hem's free Bible Study Can You Hear God's Voice: How To Recognize The Leading of the Holy Spirit. Okay so this is about 2 situations. The first is about a prayer journey over a friend of mine. Her husband is out of work and she's a wonderful homemaker. She prayed for guidance and asked us to do the same...also said she could do child caregiver work if we knew of anyone who needed it. Weeks went by and God spoke to me--the little whisper voice in prayer that seems like my own thought except it's not mine--my friend is working. Well I had not heard from my friend who lives more than 2000 miles away from me. I half believed and half doubted this voice. So I emailed my friend. The next day she responded back with "I've been working for a few weeks now full time as a child caregiver". So--praise God for giving her work and shame on me for not believing him at his whisper. The next situation I am presently in. This same voice during another quiet prayer time told me my Pop Pop is going home (dying). "That night?" is what I asked and "soon" was the reply. So I prayed some more and said "okay, if it's your will but I really want to see him again and hopefully carry a tradition of sharing Jesus with my Tori who's 4. Can it wait?" Today I called my Pop Pop after having emailed my Mom asking if he's okay. Pop Pop is alive and well--sort of. He has heart trouble and a pacemaker and many medications. He is supposed to take it easy. He decided to transplant 8 trees as tall as me to other places in his yard. This requires digging 8 very large holes (hard work) and lifting 8 heavy sapplings (more hard work) after having dug them up--in 80 degree weather! Good grief maybe I was praying to keep my Pop Pop alive a while longer! Pop Pop said he'd dig no more holes lest one ends up his grave...or unless someone gives him a nice citrus tree to plant. Pop Pop's a man of faith and he didn't think it one bit crazy what my story was. He feels there is a message in there and to keep listening. So I don't know what the second situation is but during the worry and angst of the day before I spoke with Pop Pop came that voice again. "Be still and know that I am God". So okay I am still. Really still listening for what is next!